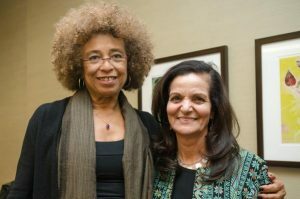 A Palestinian born in Israel, Rasmea Yousef Odeh was convicted for her role in two terrorist bombings, one of which killed two students in 1969. The students were simply shopping for groceries. Odeh was caught and tried in a civilian Israeli court. Convicted of murder, she was to serve life, but only served ten years in prison before being released in a prisoner exchange. Odeh had no special skills needed in the United States, but was still allowed to enter this nation and in 2004 became a citizen by lying on her application. She stated she had never been involved in an act of terrorism or been associated with a terrorist group and that she had never been convicted of a crime. Her past caught up to her in 2014 and she was arrested for fraudulently obtaining citizenship in the United States. At great cost to taxpayers the story did not end there. After evidence of obvious fraud was presented, Odeh was sentenced to 18 months in federal prison on March 12, 2015, stripped of her US citizenship, and was to be deported from the United States to Jordan after serving her sentence. Instead she is free on bail pending appeals. High priced attorneys, paid for by some unknown source, appealed her conviction and it was vacated by the 6th Circuit Court of Appeals in February 2016. Odeh is set for a new trial this Spring as soon as she is done with her latest “women’s march” demonstration demanding the United States open its borders. She now claims that post-traumatic stress disorder caused her to lie on her application. During the last two years of the Obama Administration, Christians from the Middle East who entered the United States illegally were rounded up and deported without trial. Even spokesmen for the persecuted Christians of the Middle East were refused entry to testify before congressional committees. The lie has been circulated that less than half of “refugees” from the Middle East are Muslim. That is not true. Of the “refugees” admitted from Syria, 99% were Muslim and of those, a full 97% were Sunnis. The Islamic State (ISIL) is a Sunni Muslim organization as are al-Qaeda and the Taliban. Extreme Vetting: President Trump says he wants “extreme vetting” of refugees and has issued a new executive order. Those applying for citizenship are supposed to receive “extreme vetting” as a norm, yet from the case of Odeh it is obvious that her records in Israel were never checked. Israel is a record keeping nation, and the government can find traffic law violations committed twenty years ago, if needed. Many of the criminal records in Iraq and Syria have been destroyed. Worse yet, if the Syrian government produced records showing that one of their citizens killed a policeman, Senator John McCain would probably show up as a character witness to say the murder was a great and noble act. No amount of “vetting,” extreme or otherwise, is going to stop radical Sunni Muslims from entering the United States. For the most part the State Department takes the word of the applicants. Meanwhile Christian refugees from Syria, who pose no threat, have been and continue to be excluded because the process is unfair. No Syrian or Iraqi Christian can apply for refugee status or citizenship at the American embassies in Jordan, Lebanon or Turkey even if they have relatives who are American citizens who live in the United States. They must first go to the United Nations High Commission on Refugees office (UNHCR) and apply there. These offices, located in majority Sunni Muslim nations, are run by Sunni Muslims. The UNHCR has no Christian employees in Jordan. The UHCR must be bypassed and that can only be done with congressional legislation. There is now a bill (HR-390) before Congress to bypass the UNHCR and allow Christians and other persecuted minorities in Iraq and Syria to apply directly out our embassies. HR-390 is not just about immigration. The bill also addresses aid to be given to assist Iraqi and Syrian refugees. Under the bill that aid must reach the Christians and other religious minorities. Today in Jordan, Iraq and other nations with large numbers of refugees, aid is limited to only those refugees in camps that are “registered” with the United Nations. Most Christians are afraid to register with an organization they know is run by Sunni Muslims after being run out of their native lands by Sunni Muslim terrorists. As a result, they receive no aid. HR-390 would address that issue. HR-390 would require agencies delivering aid to do so in a proportionate manner with special attention to groups, such as the Christians of Syria, who have suffered genocide. The Religious Freedom Coalition has begun a mass campaign to help Congressman Chris Smith (R-NJ) obtain co-sponsors and to get a vote on HR-390 in the House. The campaign also demands that the Senate pass a companion bill. Some supporters of the Religious Freedom Coalition have already received post cards to mail to their congressman and Senators. By the end of March, every Religious Freedom Coalition supporter should receive the cards to mail to Capitol Hill along with a long explanation of the reasons and process. There you will find an explanation of the bill and a button to press to send a fax to your congressman free of charge. Sending a fax to Congress and then later sending the signed post card shows your resolve. You can also call your congressman’s local office. This bill is important because it would bypass the United Nations and assist Iraqi and Syrian Christians directly. Congressman Trent Franks to help: Last week I had lunch with Congressman Trent Franks (R-AZ). Congressman Franks is the founder and chairman of the International Religious Freedom Caucus. The caucus is made up of congressmen who believe strongly that religious freedom is the first freedom. Any nation that does not have religious freedom cannot be free. If freedom of religion is repressed, then there can be no freedom of speech, press or assembly. Congressman Franks asked me about the situation in Iraq and Syria and I gave him my blunt opinion of the situation. I urged him to recruit the members of the International Religious Freedom Caucus to aggressively seek co-sponsors for HR-390 to assist the Christian victims of genocide in Iraq and Syria. I have known Congressman Franks for over a decade and while in Arizona I attended church with him. He is a dedicate Believer who approaches everything he does in Congress from a Biblical prospective. He was the head of an oil exploration company before he was first elected to Congress and handed the reins of the company to his younger brother so he could devote his full time to his work in Congress. Babies of Iraqi Christian refugees fleeing the Islamic State need diapers.